One thing I've missed since switching from Windows to Mac is a simple tool that allows you to see at a glance which are the biggest folders and sub-folders on my machine. On Windows I used the excellent TreeSize, and WhatSize is probably the closest equivalent you'll find on the Mac. 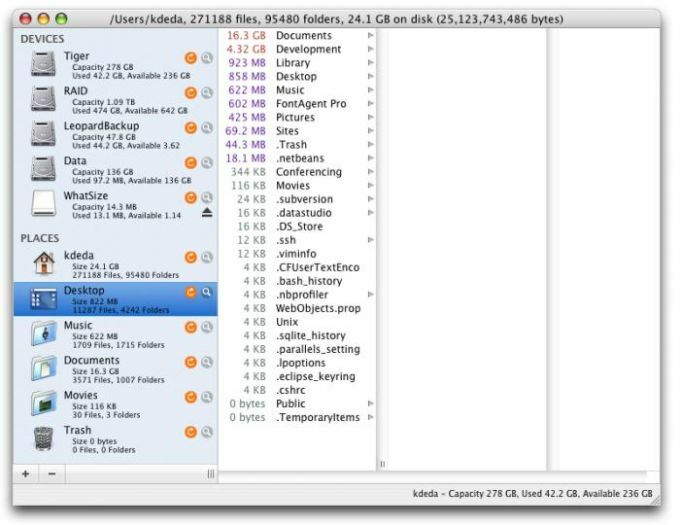 WhatSize is a simple tool that allows you to quickly measure the size in bytes of a given folder and all subfolders and files within it. 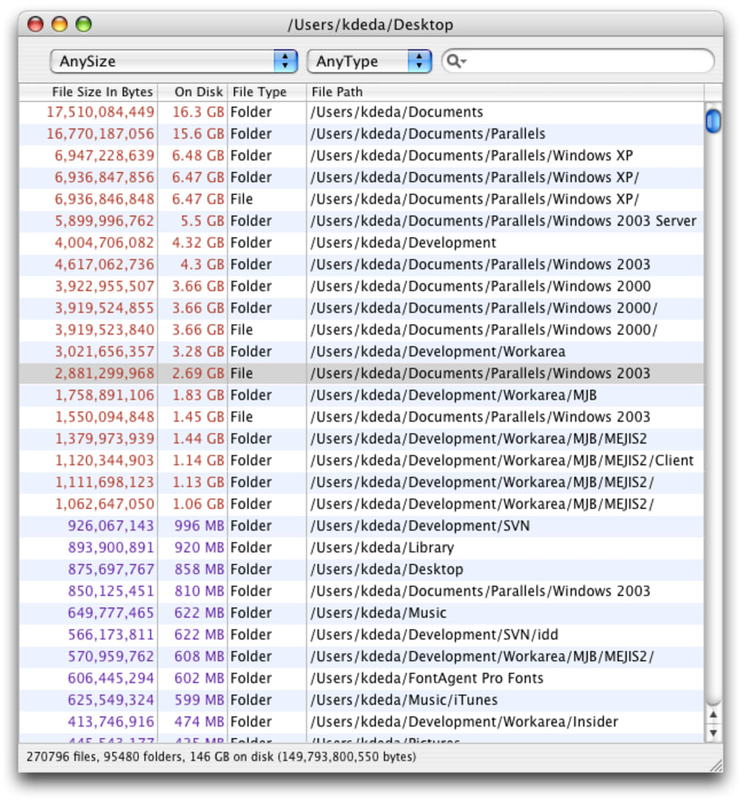 The files and folders are automatically sorted by size, with the biggest sizes first. This makes it very easy to see which folders are occupying valuable space on your hard drive and if they're useless, to simply delete them. WhatSize also includes hidden files, cache files and directories and you can also choose to filter certain file types (such as multimedia) or only find those files over a certain size. Once the measuring of a folder has ended the user can also view the information by filtering for particular file sizes or types. What can be a drawback with these programs - as with TreeSize on Windows - is the time it takes to calculate file sizes and go through your system but WhatSize works remarkably fast. Unfortunately, the trial version will only measure up to 20GB of data but you can buy a modestly priced license to remove this restriction plus it gives you access to a few other preference and admin features. If you're tired of Finder's lack of support for showing how big folders and sub-folders are in an easy to read way, WhatSize could help you finally get rid of those useless disk hogging files. Free to all users. DO NOT UPDATE IF YOU ARE USING MAC OSX 10.3. Recommended to all Users. Added modified date to the CSV exports. Added ability to export very large folders. Fixed intermittent crash when updating using Sparkle. great app. excellent- I used it to delete duplicates, worked very well, got rid of 15 Gigs of duplicates and it also weeded out not deleting files which are attached to the root of the computer. WhatSize Solved My Problem. I had an internal hardrive that showed 238 gigs being used more than the folder size total of the drive. I did a system reinstall and archive. This did not solve my problem. I purchased WhatSize and it found an invisible folder with 238 gigs of my image files from my external drives. I have no idea how this happened. WhatSize was able to delete this folder and my harddrive free space usage returned to normal. The best $13 I ever spent on software!!! WhatSize will allow me to monitor my hard drives and solve this kind of problem if it occurs again. Works exactly as described. I originally used another program which found the invisble file, but would not delete it. What do you think about WhatSize? Do you recommend it? Why?